More than 2,300 nominations from organizations of all sizes and in virtually every industry were evaluated in this year’s competition. DP DHL was the most honored organization, earning the top Grand Stevie Award. Winners in the eleventh annual Stevie® Awards for Sales & Customer Service, recognized as the world's top customer service awards and sales awards, were unveiled on Friday night at a gala ceremony in Las Vegas, Nevada attended by more than 650 executives from around the world. 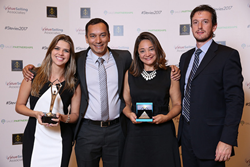 DP DHL, with Gold, Silver and Bronze Stevie Award wins for activities worldwide, in Argentina, Lebanon, United Arab Emirates, and the U.S.A., among other nations, was the most honored organization this year, earning the top Grand Stevie Award trophy for the fourth consecutive year. Other Grand Stevie Award winners, in descending order, include Visualize, HomeServe USA, Delta Air Lines, GuideWell Connect, IBM, VIZIO Inc., Carbonite, Inc., WePay Inc, and Concentrix. Among other Stevie winners, Carbonite Inc., HomeServe USA, IBM, and iHeartMedia won four Gold Stevie Awards, the most from all organizations. Cisco Systems, ClearVision Optical Company, Optum Consumer Sales and Services, UNOX, Vivint Smart Home, and WePay Inc took home three Gold Stevies. Winners of two Gold Stevie Awards include Ally Bank, CAC 2000 Ltd, Delta Air Lines, Inc., Dow Jones & Co., GuideWell Connect, Imparta Inc., Inci Akü GS Yuasa, Infinity, John Hancock Financial Services, ListenTrust, Network Alliance, Odeabank, VIZIO Inc, and Wilson Learning. Winners in the People’s Choice Stevie® Awards for Favorite Customer Service, as determined by more than 149,000 public votes, were also awarded at the event to organizations including Bombardier Aerospace, Chewy, CommonBond, CubeSmart, Distinguished Programs, FieldEdge, GPS Insight, j2 Global, Inc., Marriott Vacation Club Owner Services, Ultimate Software, Unitrends, and Zelis Payments. The presentations were broadcast live via Livestream, and are still available to watch online. The awards are presented by the Stevie Awards, which organizes several of the world’s leading business award shows including the prestigious International Business Awards and The American Business Awards. More than 75 members of several specialized judging committees determined the Gold, Silver and Bronze Stevie Award placements from among the Finalists during final judging, that took place January 23 - February 1.